I think that most photo hunters will say that their family is the most important thing in their lives, however I don’t usually post photos of my family, except occasionally my granddaughter. However I expect there will be a lot of photos of what I consider the two most important things in my life, after my family. The first one enables me to interact with you and of course is my computer. 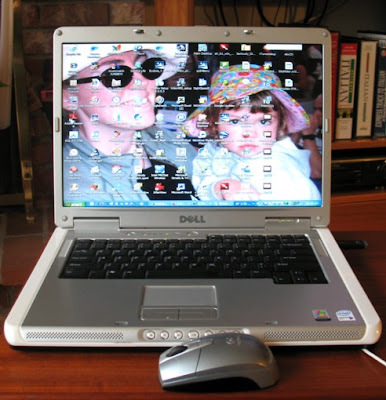 Yes my Dell Inspiron 6400 laptop, desperately in need of a memory upgrade from 1 GB total RAM to 2GB, hopefully soon. Yes, that is my daughter and granddaughter on the desktop. Equally important in my life are my books. My many, many books. Thousands of books, for I never get rid of any of them. Oh, oh. 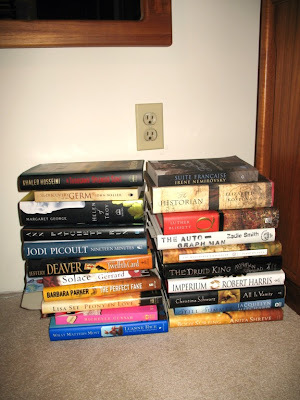 I think I need more bookshelves, they are in piles on the floor again. 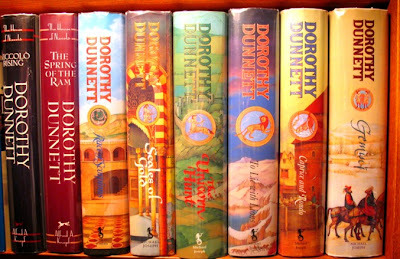 My most important books are my hardcovers of my favourite books, the House of Niccolo, an eight part series of historical novels by the Scottish author Dorothy Dunnett, some of which are autographed by the author.